There are “washing stations” around the plaza. These are fountains where people ritually wash their hands before praying at the Western wall. The directions for a basin to be set up for the ritual washing of the priests' hands and feet is the first mention of the practice. In these verses, the failure to hand washing is tied to the possibility of death, and it is this reason that some believe that Aaron's sons died in Leviticus 10. After the destruction of the Temple, however, there was a change in the focus of hand washing. Without the ritual objects and processes of the sacrifices, and without sacrifices, the priests were no longer able to wash their hands. 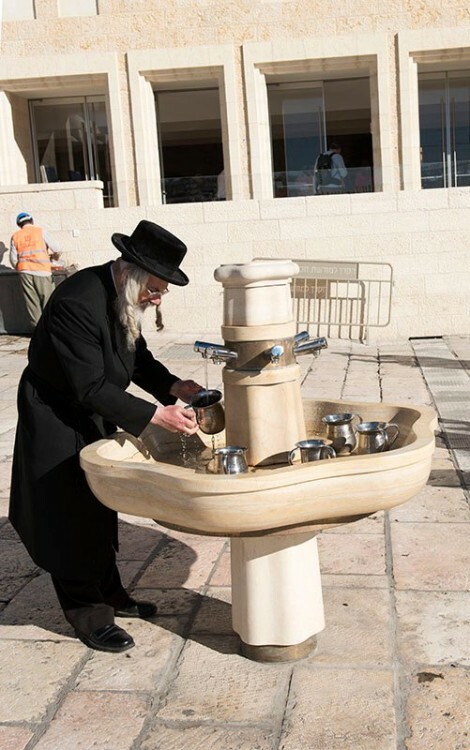 The rabbis, not wanting the hand washing ritual's importance to be forgotten at the time of the rebuilding of the (Third) Temple moved the sanctity of the Temple sacrifice to the dining room table, which became the modern-day mizbeach, or altar. With this change, the rabbis committed countless pages -- an entire tractate -- of the Talmud to the halachot (laws) of hand washing. Called Yadayim (hands), this tractate discusses the ritual of hand washing, how it's practiced, what water is considered clean, and so on.